After the split of Neil Hannon's band TDC in 1992, he went back to Enniskillen and locked himself up in his room. It seems that he never left it but to watch some old movie. During all that time, he wrote Liberation and most of Promenade. 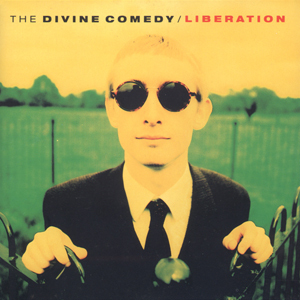 Liberation was recorded in four weeks in March 1993 at Fundamental Studios, in London. It was released a few months later, in August. Musically, the album is the absolute opposite of what Neil used to do. That's why he changed his clothes. He put on the only suit he had and sunglasses and had his hair cut and died (!). The songs can be divided into two blocks. The first one is made of the older songs, written before the split and which are 'Timewatching' and 'Europop' of course, but also 'Death Of A Supernaturalist', 'I Was Born Yesterday' and 'Lucy'. All the other songs were written in 1992/1993. Because of this there wouldn't seem to be any coherent theme between the songs, yet the very title of the album is the theme. The fact that Neil is now playing without a band, doing most of the job (even production) himself, is an obvious sign of liberation. Moreover, the musical change is in itself a proof of liberation as well. Besides, some lyrics are pregnant with the theme of freedom, or by opposition, oppression ('Bernice Bobs Her Hair', 'Three Sisters', 'I Was Born Yesterday', 'Death Of A Supernaturalist', even 'Festive Road' or 'Your Daddy's Car' could be included.). The songs are also full of references: Nat King Cole in 'Timewatching', Wordsworth in 'Lucy', Chekhov in 'Three Sisters', Francis Scott Fitzgerald in 'Bernice Bobs Her Hair', Mr Benn in 'Festive Road' and of course, A Room With A View in 'Death Of A Supernaturalist'. After watching the film, Neil decided to (re-)read the novel. He then read all of Forster's works. Later, he declared: "When I saw the Merchant Ivory movie A Room With A View, E.M. Forster changed my life beyond all recognition, really. Without A Room With A View I'd probably never have written anything I've written. After seeing the film I read everything by Forster. I threw off the shackles of indie-pop and I was able to write music. It was "Liberation" by name and nature."